Home » Living Room » The Payplan guide to getting married on a budget. The Payplan guide to getting married on a budget. While your wedding day can be one of the best days of your life, the cost of getting married can easily spiral out of control, especially if you get caught up in the excitement and keep adding things to your wish-list. Remember that it’s not a good idea to get into even more debt in order to fund a wedding. Relationships are notoriously susceptible to stress as a result of debts and financial struggle, so if you really do want to get married then you’re going to have to make a few compromises. Indeed, a wedding could cost upwards of £20,000 or more when the ceremony, rings, dress, reception and honeymoon are all accounted for. But how much of the expensive little touches do you really need? In actual fact, in these more austere times it’s becoming more fashionable to have a small meaningful ceremony rather than a flash extravagant event. A small carefully-planned budget wedding can most certainly be an event that you and your guests will remember for the rest of your lives. What’s Included In A Wedding? At its most basic level, in the UK a Christian or civil wedding comprises a formal ceremony in front of at least two independent witnesses, in which a ring is used to symbolically represent the joining of two parties in marriage. But of course we all want to celebrate our happy day with friends and relatives. And there are various traditions that many of us wish to observe, and then there are certain wedding touches that have become fashionable to have. So including the bare legal minimum, your wedding wish-list could possibly feature: church or civil ceremony fees, wedding rings, bride’s dress and accessories, bride’s bouquet, flowers for the venue, bridesmaids’ dresses, groom’s suit, a wedding car, reception venue, venue decorations, food for guests, drinks for the toasts, wedding favours, wedding cake, photographer, evening entertainment (DJ and live band), invitations, wedding night hotel, gifts for the wedding party, a stag party, a hen party and a honeymoon! This might be a fairly exhaustive list, and you may not actually desire all the things on the list above, but it can give you an idea of how those costs rack up. Particularly when it seems many products and services come with a premium price once the word ‘wedding’ is mentioned. Saving can be difficult at the best of times, and we understand that it’s even more difficult when you’re in a debt plan. As a Payplan client you probably have a basic bank account that isn’t linked or related in any way to your creditors. You might recall from when you first dealt with Payplan, that we probably advised you to open a new ‘basic bank account’ with an organisation that is not linked to your creditors, in order to avoid companies taking money from your account without your permission. This is known as ‘the right to offset’. So if you are able to save any money for your wedding, no matter how little, please don’t be tempted to put these savings into one of your other existing bank accounts because you could find that that bank may use these funds for repayment of other linked debts. Banks can do this without even telling you and, although they’re legally within their rights to do this, this can cause much frustration and distress. So how can you cut costs? One of the best ways you can slash the cost of a wedding is to have a really hard look at things that you could realistically make do without. If money was no object, then we could all probably spend millions of pounds very easily on a dream lifestyle. But in life we compromise depending on what our budget is. You can apply this to your wedding too. We understand that you probably have an idea about what your dream wedding would include, but is it really worth going even deeper into debt for just one day of celebration? There are many ways you can address a limited budget. For example, the wedding dress is probably only going to be worn once, so do you really need to buy it? If you can find a dress that you can rent then you’re likely to shave hundreds of pounds off your costs. Can you remember a wedding you went to five years ago? You probably can. Can you remember which favours you had on the table? Probably not. What about the flowers and decorations? You could leave out many small details and your guests are still likely to enjoy themselves every bit as much. Another huge cost-cutting exercise you could try is to get married during a weekday. The fact is, most people get married on a Saturday. This is understandable because most people don’t work on a weekend, and a Saturday wedding is therefore more convenient for everyone concerned. But the lack of people wanting to get married during a weekday means that reception venue prices can be much lower than they are on a weekend. You may well find that the prices of other services might be lower too. Researching local companies can reveal that many companies might charge very different prices for very similar products or services, so don’t choose the first company you find. And when you do choose a company to approach, it can’t hurt to try to negotiate the price a little lower. Haggling a bit can be a bit daunting for most of us, but if it gets a few quid discount then surely it’s worth trying. Finally in this section, you need to seriously consider how many guests you’re going to have. While it would be lovely to share the big day with everyone you both know, of course in practice you will have to make a compromise on the number of people you invite as this will have a direct effect on the cost of your reception. Then when you’ve pared the number of guests to the minimum, can you find a smaller and cheaper reception venue in order to host them? Can You Find Cheaper Alternatives? Once you’ve decided on what you could comfortably do without, have a look at your remaining list, which now comprises wedding day ‘must-haves’. 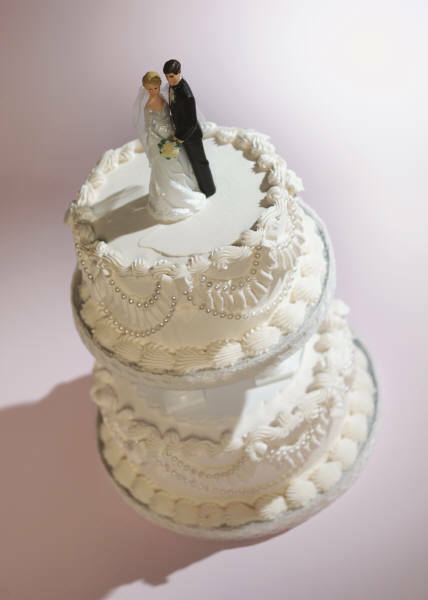 When it comes to ancillary wedding touches such as the wedding cake or invitations, you could save hundreds of pounds if you or a friend or acquaintance can bake or design. Even though you’re sure to reimburse them for their efforts, compared with how much you would have spent you’re likely to save a lot of money. Flowers are a huge expense on a wedding day. You may be able to source silk flowers cheaper than real flowers. These will work fine for buttonholes, venue decoration and table decoration, and if you’re careful you may be able to sell them on to someone too.